Unusual perils in your morning commute: will your insurance cover this? How’s your morning commute? This commuter encountered an unusual peril, a unique example of road rage, with the Nissan Pathfinder coming out on the losing side. This clip is dramatic evidence of the size of an American bison in relation to a car – pretty formidable. Below is a clip of an Alaskan moose ambling down the highway to give you a dramatic size perspective. The 16th annual State Farm deer-vehicle collision study has some good news. 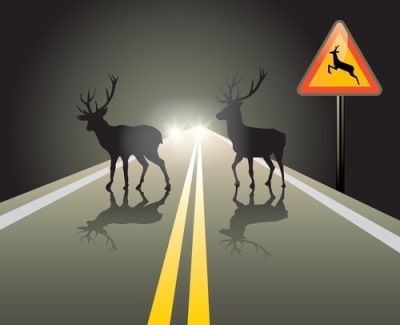 Overall in the U.S., drivers were less likely — one in 167 — to have a crash involving a collision with deer, elk, moose, or caribou. Last year’s survey put that chance at one in 162. It is estimated deer, elk, moose, and caribou collisions dropped slightly to 1.33 million in the U.S. between July 1, 2017 and June 30, 2018 — down from 1.34 million in 2017. And, this is despite the fact that there are nearly four million more licensed drivers. Those odds are in about the same range as being audited by the IRS (1 in 175) so when you think of it that way, it’s worth thinking about how you’d react to this hazard in a driving situation. The Insurance Institute for Highway Safety tracks fatalities in animal-vehicle crashes, marking 211 in 2017. They include a breakdown by state. 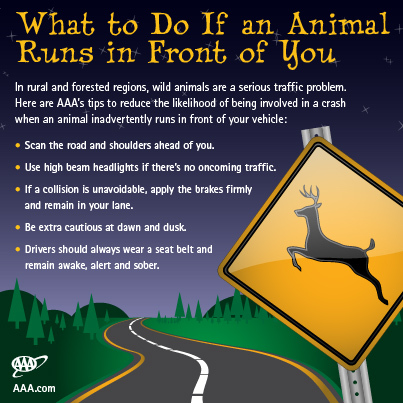 If you see a deer in the road, should you swerve or not? Here’s some advice from safety expert Mike Winterle, who advises you not to swerve. Does insurance cover animal-vehicle collision damage? Damage caused by an accident with deer or other animals is covered under the optional comprehensive portion (not the collision portion) of an automobile insurance policy. Comprehensive auto insurance includes coverage for: fire, theft, vandalism or malicious damage, riot, flood, earthquake or explosion, hail, windstorm, falling or flying objects, damage due to contact with a bird or animal, and sometimes, depending on the policy, windshield damage. Do you need comprehensive insurance? That probably depends on a lot of factors such as the age of your car and how much you depend on your vehicle. Could you afford to repair or replace it if you have a collision with moose or damage from weather-related perils or human-generated vandalism? Your independent insurance agent can get you a quote and help you think through such scenarios to assess the cost-benefit in your particular situation. As you’re out on the roads leaf-peeping, visiting apple orchards or commuting to-and-from work this autumn, keep a sharp eye out: The likelihood of striking a deer more than doubles in the fall. Your normal odds of a ruminant-related collision claim is about 1 in 169, but the likelihood more than doubles during October, November and December, according to research by State Farm. For auto insurance advice, find a New England independent insurance agent – our members are the best! When the days get hot and steamy, who doesn’t like a dip in the pool? And while you may not mind sharing the pool with your dog, you may feel less generous about sharing it with other critters. Even if you have a barrier system to keep uninvited visitors out, some pool crashers are persistent. Here’s a group of wild animals who just couldn’t resist the allure of a nice cool pool. While having a bear or a moose take a dip in your pool might make for a good YouTube video, you probably do not want to be the neighborhood wildlife watering hole. Visits by the larger species are rare occurrences but small critters, particularly baby animals, can easily find their way in but not so easily find their way out. The Humane Society offers tips for pool safety for wild animals. These stories all have happy endings, but you can’t be too safe. Pool barriers aren’t just for wildlife — unsupervised kids are attracted to pools too, all-too-often with tragic results. About 400 children drown in pools each year and there are also more than 5,000 near-drownings or injuries. Pool Safely offers a variety of safety resources for residential pool / spa owners – as well as for commercial and other pool owners. They offer great information on the latest safety systems, from barriers and alarms to safety covers. 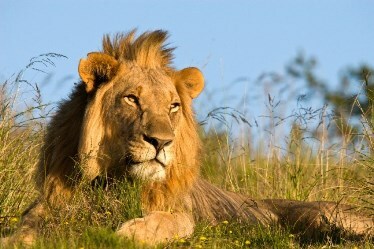 Sunday is World Lion Day, a global campaign to celebrate the importance of the lion and to help prevent these majestic creatures from going extinct. If you’d like to learn more about how to support lions, click for a list of organizations active in lion conservation and research. And we have a few amazing videos to get you in the spirit. This clip is a fun & fascinating clip of lions interacting with a robotic camera buggy -like any cat, they were most curious and photographer Chris McLennon got some truly remarkable shots – up close and personal. If you can’t access the video, see some photos and animated gifs here. The next is an 11 minute clip on Kevin Richardson, called the Lion Whisperer due to his unique bond with these terrifying but majestic predators. Incredible! If these videos remind you of their domestic counterpart, the housecat, you may be inspired to adopt a slightly tamer cat from your nearby shelter! Curious Klepto Critters Steal Cameras: Will insurance cover this? Cameras are a prime target for theft — and not all thieves are of the human variety. Apparently, animals are almost as intrigued by cameras and selfies as we are. See the cute video clips below. If a monkey or an eagle steals your camera while you’re on vacation, will your insurance cover that? If you have homeowners, renters or condo insurance, it should – most policies would cover your possessions at home and away, up to a specified dollar limit. Of course, it depends on your particular policy, so check with your agent about your coverage and limits — and to discuss any particularly expensive equipment, collections or items. If these exceed your limits, you may need a valuable property rider. And remember – keep a home inventory, if you don’t already have one. When you buy expensive technology, it’s a good idea to register it with the manufacturer – not just for the warranty but also for the serial numbers, which can help with tracking in the event of a theft. There’s an online database that might help with recovery — at least if your thief is human. If your thief is of the animal variety, you’re on your own! Just remember – don’t put yourself in any danger if you are being robbed, whether animal or human. Property is replaceable – you aren’t.